After Canz, TC really wanted to go to this street meat cart. The games had been called on account of rain, none of us had umbrellas, but we gamely trekked around Astoria and discovered they’d gone home. 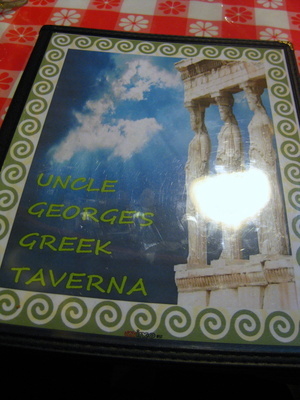 So instead we wandered over to Uncle George’s, where both TC and Gary had been before (separately), and got our Greek food on. 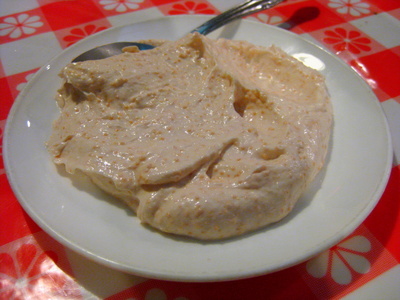 As soon as I saw taramosalata (cod roe spread/dip) on the menu, I had to get it. I seek this out everywhere I go, and luckily, the boys obliged and helped me eat it. This was definitely not the jarred stuff, which tends to taste tinny and metallic. I thought it was good, though definitely not as good as some other places… I wouldn’t be against ordering this again, though! The boys both ordered the combination platter, which I hadn’t noticed on the menu – gyro AND souvlaki. They happily ate their platters. I tried some of the gyro meat and was surprised to find it was actually really, really good – not gamey or sometimes there’s this off-taste to gyro meat, which skeeves me. I ordered just the souvlaki. The salad was lightly dressed, and really tasty, with good tzatziki on the side. 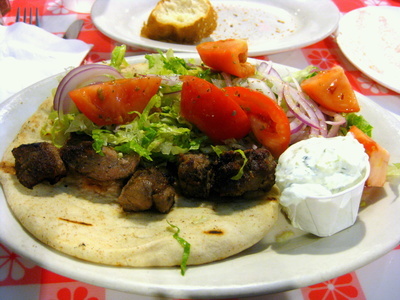 The souvlaki, however, was a bit dry and overcooked, and needed the tzatziki to boost it a bit. Still tasty, just overcooked. Ah well. Next time: gyro only, please! Yvo says: Great little Greek diner-style place to enjoy some post-drinking munchies. Prices seemed reasonable (I didn’t pay, actually – thanks Gary! ), and service was efficient, quick. I would probably return if I was in the area again, though I definitely wouldn’t consider this destination dining. Have you tried Taverna Kyclades? It’s the best “bang of the buck” Greek restaurant in Astoria, but gets super crowded. I love Greek food, especially the mezes with unlimited pita bread and the salads. I want some of this please! A bit chewy and soft but the main attraction is the MEATS. 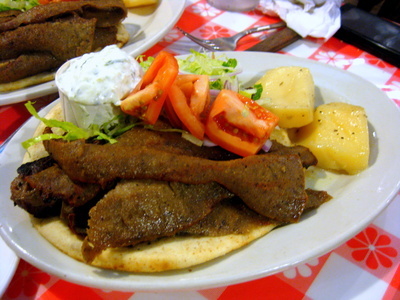 Mmmmm – gyro meat. I have never found it gamey though, and I eat gamey stuff, life squirrel and deer [hush up, heehee] The few places we buy it here seem to be pretty authentic and well spiced. I am calling Pooldad now to bring me home a gyro for dinner. WANT! 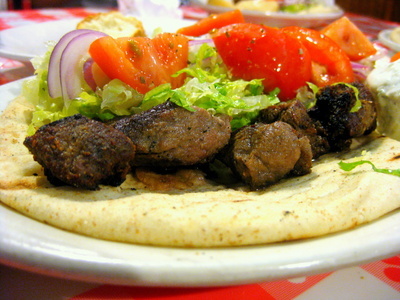 Gyro meat is a fav for me. The pork souvlaki and lemon taters was otay. Not bad. I happily devoured both meats with the pita, vegs, and tzatziki. Thanks again Gary. Best wishes to your St. Louis Cards.